On New Year's Eve Where I Am. How on earth did that happen? I promised a blog tomorrow, and that was over a week ago. I wrote an essay, and I wrote a short story, and I went to Sydney and did a reading with a string quartet, but I didn't blog. And now I'm sitting backstage at Revolt in Melbourne preparing for a New Year's Eve Party- Masquerade-thing and I missed my blog. So while there is wireless, there is hope, and I am writing this. Many exciting and wonderful things have happened in the time that I have been not-blogging. For example, I was quoted by Tom Stoppard. My story "A Case of Death and Honey" from A Study in Sherlock and the upcoming Jonathan Strahan edited anthology Best SF and Fantasy of the Year Volume 6 was written about on the Tor.com website in a way that made me happy. Short story writing is a lot like Don Marquis's description of poetry writing as flinging rose petals into the Grand Canyon and listening for the boom. Normally there is silence, so even a little response to a short story is a good thing for an author. You can read the Tor.com piece, by Niall Alexander, at http://www.tor.com/blogs/2011/12/the-adventure-of-the-devils-foot-neil-gaiman-and-the-great-detective. The first volume of Les Klinger's remarkable four volume Annotated Sandman comes out in a couple of weeks: reserve your copies from your local comic store or bookshop now. Here's a great article about Allegra Rosenberg, who makes Time Lord Rock in Chicago. She's sixteen, although I said she was fifteen when I introduced her from the stage when I was doing the Not My Job quiz on "Wait Wait Don't Tell Me". And you can listen to the Wait Wait interview at http://www.npr.org/2011/12/24/144146842/author-neil-gaiman-plays-not-my-job. (You can read it there, too. But listen to it, don't read it.) I can't embed it. However, the recent Symphony Space SELECTED SHORTS is embeddable, and I have embedded it. It has me reading "Troll Bridge" along with one of my favourite Jorge Luis Borges stories, "The Circular Ruins". I had a marvellous time with the FourPlay String Quartet in Sydney a few days ago. Flew home and went straight to the Melbourne City Library where Amanda and I read (me) and sang (her). 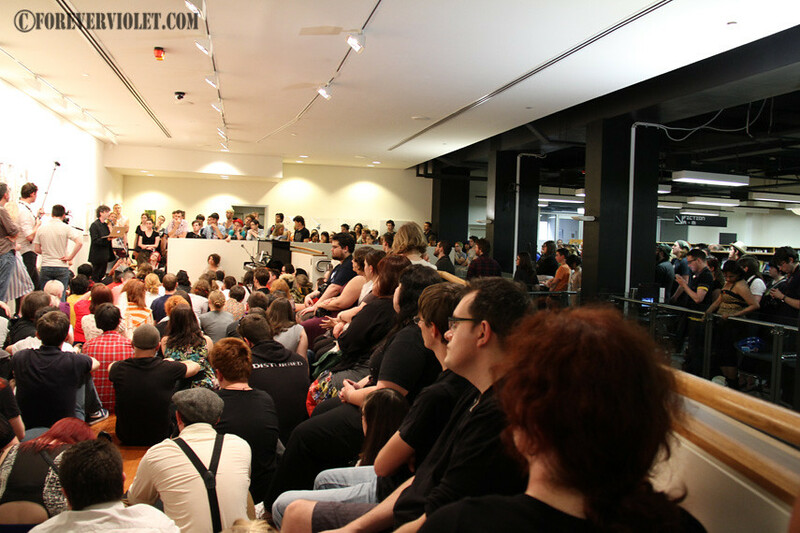 We'd announced that we'd be there on Twitter just before my plane took off, and about four hundred people showed up. Melbourne City Library is amazing. It has a piano, and librarians so nice and creative I wanted to take them on the road with me. 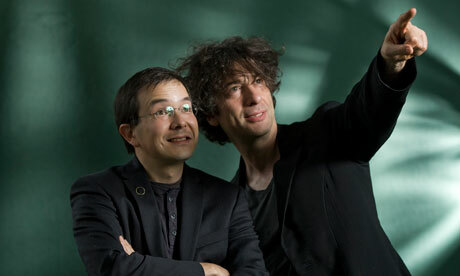 We'd be Neil Gaiman and his posse of travelling librarians. Throughout any given year I shoot thousands of photos, so when I was recently asked which one was my personal favorite of 2011, I had a difficult time answering. However, when thinking about it over a couple of days, the one above kept jumping out at me. 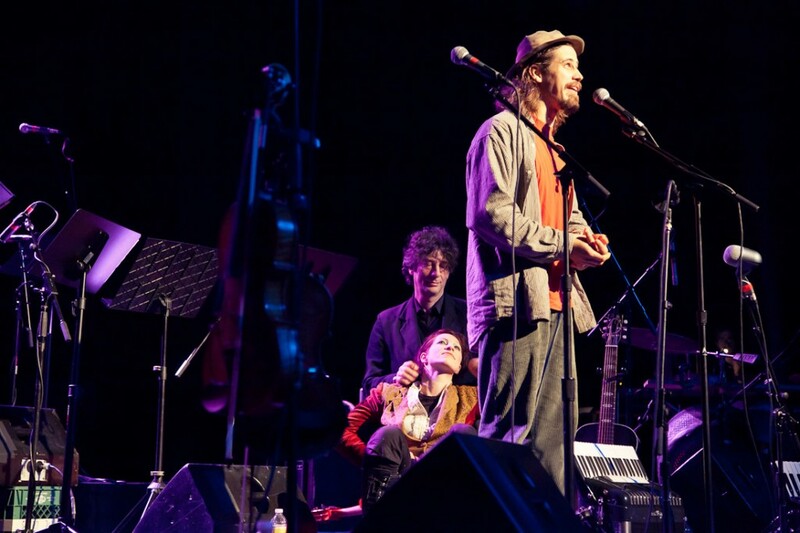 On 11-11-11 I documented Jason Webley‘s concert at The Moore in Seattle. That was where I caught this moment in time. 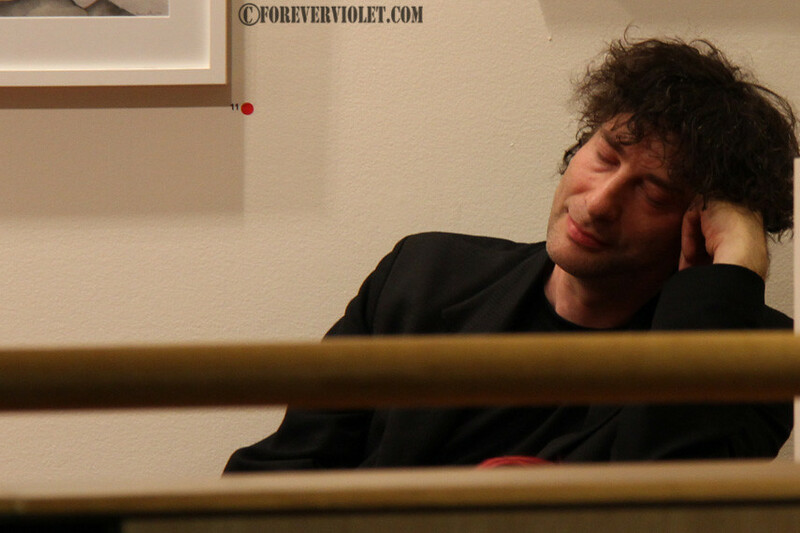 Webley is talking about the virtues of love, while Neil Gaiman and Amanda Palmer sit together behind him, listening. There is enough intimacy in this photo, that I felt a little like a peeping tom as I put it through post processing, like I was crashing a private party. I actually had to remind myself that it was taken at a public event. That is why this is my favorite photo of 2011. It makes me feel like giving my wife a kiss, putting on some good music and take pleasure in the little things in life. 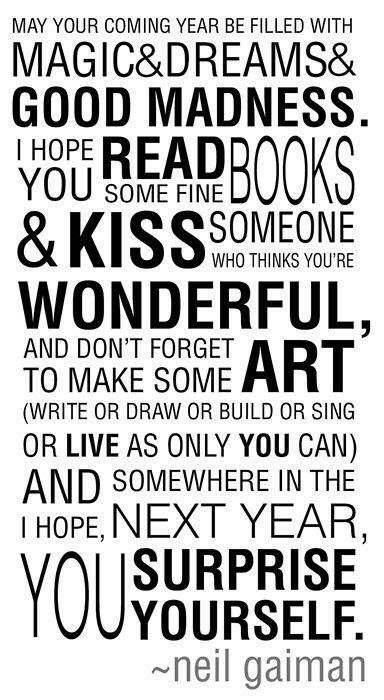 And for New Year's Messages... I have to write one for tonight in Melbourne as soon as I finish this. It has to be as good as the ones I've written for this blog, over the years. Normally I don't stop and think. I just write what I'd want in the coming year, and hope that other people would want that too. In case you were wondering where I am - and I would not blame you if you were, for I frequently am unsure, and I keep tabs on me, -- I am in Melbourne, the one in Australia not the one in Florida. I am staying with my friends Peter Nicholls and Clare Coney, and am here with my wife, who is going to be doing all sorts of rock and roll things in Australia for the next few months. I got here last week and promptly did an event for the Wheeler Centre, at the Atheneum Theatre, which was, despite the jet-lag, enormous fun, and even more fun because I got to spend time with Tom Stoppard, who I met back in 2007 in Brazil, and like enormously. The episode of Selected Shorts in which I read TROLL BRIDGE has gone up at http://www.selectedshorts.org/onair/, with a direct link to the audio here. It's lots of fun, and there's a Jorge Luis Borges story as well. In addition, she's giving $5 off each item in the store, with the code nice-kitty. It's the time of year when I like to link to this Independent article I did a few years ago. I do not recall lobbying for anything, as a boy, as hard as I lobbied, with my sisters, for a Christmas tree. My parents objected. "We're Jewish," they said. "We don't do Christmas. We do Hanukkah instead." 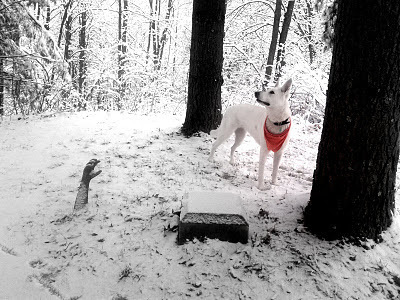 The "Wait Wait Don't Tell Me" special goes out on the 23rd of December, on NPR and on TV. I'm told that there's a lot more of me on the radio than there will be on the telly. "I think once everybody got a look at it, they realized the throne thing we put you in was a terrible mistake," explained Peter Sagal. 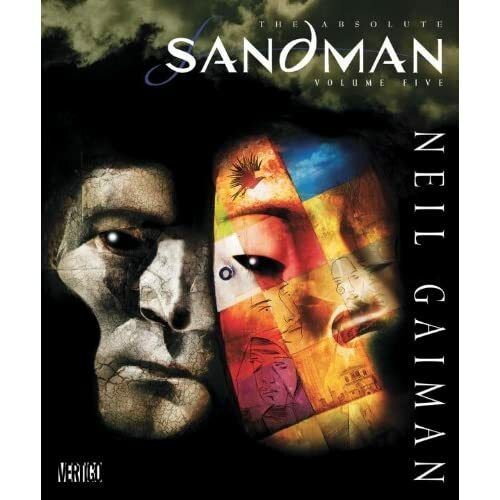 There are two new books up at Neil Gaiman presents, and I'm thrilled about both of them. ANITA was a book I remembered from my teenage years. It's a book about a young witch in the 1960s. It has the best grandmother in fiction in it, better even than the one in the Addams Family. It's funny and sweet and creepy and moving. There's a sample of it at http://www.audible.com/pd?asin=B006L7BA6O&source_code=NGAOR0002WS101911 - Nicola Barber reads it, and I think her reading is excellent. If you loved the audiobook we did of Keith Roberts' Pavane... I'm afraid this is nothing like that at all. Tickets went on-sale for the EVENING WITH NEIL GAIMAN on December 28th about an hour ago. They are $35 each for the first 150 people to buy them, and then $45 thereafter. I'm appearing at the Factory Theatre. FourPlay are the support act, and will also be playing on stage during at least one of my readings, as they did when I was at the Sydney Opera House. They are wonderful. Use this link for information and to get tickets. It's a mirror to the Factory Theatre website, to avoid crushing it with too many people at once. I went to Chicago on Friday and took part in the recording of the "Wait Wait Don't Tell Me... Royal Pain In The Year" 2011 Special. It airs on BBC America (TV) and on Public Radio on December the 23rd. I was the "Not my job" guest, and answered three questions. Whether or not I got any of them right, you will have to wait until the 23rd to find out. There's a conversation between Shaun Tan and me in the Guardian right now, and it's fun. We talk about art and suchlike. In the photo above we were standing behind the Edinburgh Book Festival authors' yurt taking it in turns to point at imaginary interesting things. ST: I don't know about you but when someone first mentions an adaptation, I have, probably a little bit inappropriately, a feeling of weariness at revisiting that work after I'd struggled with it for so many months or years. But then the second thought is "Wow, what a great opportunity to fix up all those dodgy bits." NG: It's so nice to hear you say that. Somebody asked me recently if I plot ahead of time. I said yes I do, but there is always so much room for surprise and definitely points where I don't know what's going to happen. They quoted somebody who had said: "All writers who say that they do not know what's going to happen are liars, would you believe someone who started an anecdote without knowing where it was going?" I thought, but I don't start an anecdote to find out what I think about something, I start an anecdote to say this interesting thing happened to me. Whereas I'll start any piece of art to find out what I think about something. NG: I'm going to learn something I didn't know when I began. I'm going to discover how I feel and what I think about it during the process. I will break off little bits of my head and they will become characters and things will happen and they will talk to each other. ST: Exactly, creating a character is like impersonating another being, so that you can find out what you think about something. You really find out what your style is when you diversify – setting something in a fictional landscape, the far future or distant past. A lot of people think of style or personality in terms of things you do often, but it's not really. It's what you do under duress, or outside of yourself. I don't feel I know myself really well because – again it's that emotional thing – sometimes I feel a little embarrassed by the amount of emotion that comes out in a story. I don't realise that there's so much of it locked up or in denial and then it comes out in the process of doing this conscious dreaming exercise. Big thumbs up on that. Baffled, however, by this article on Kurt Vonnegut at Guardian Books, which seems as wrongheaded as an article can be. In it we learn that a new biography of Kurt Vonnegut "undermines his warm, grandfatherly image". "A new biography of acclaimed American author Kurt Vonnegut, beloved by fans worldwide for his work's warm humour and homespun Midwestern wisdom, has shocked many with a portrayal of a bitter, angry man prone to depression and fits of temper. The book on Vonnegut, who died in 2007, lifts the lid on the writer's private life, revealing a man far removed from the grandfather-like public figure his millions of devotees adored." I read this and thought, I'm going mad. Who on Earth could read a Vonnegut book and think that he was a grandfatherly bundle of warm fuzzy happiness? I mean, I read Vonnegut first as a ten year old, and it was shocking because he could joke in the face of such blackness and bleakness, and I'd never seen an author do that before. Everything was pointless, except, possibly, a few moments of love snatched from the darkness, a few moments in which we connect, or fail to. "Warm humour and homespun Midwestern wisdom"? Bizarre. I bet it was either written from a press release, or by someone who'd never read any Vonnegut. Signed, the man who wrote the Introduction to Vonnegut's "God Bless You Dr Kevorkian"
It snowed yesterday night, and today the world looks like it only looks here once a year. 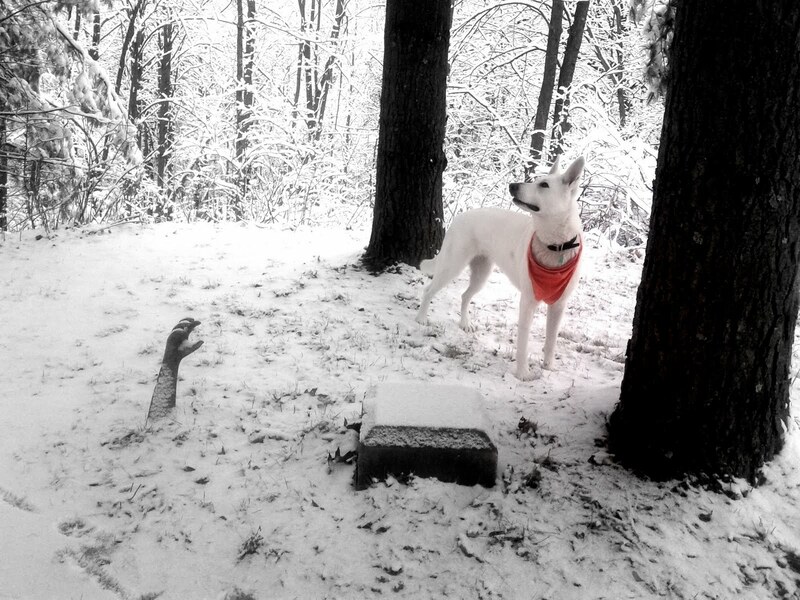 Fresh snow, for the first time, makes the world look like a Christmas Card. It's also the last day for Amanda Palmer signed Xmas card for orders from http://postwartrade.com/ over $100, which I mention as they now have a page of stuff from the Evening With Neil and Amanda tour - a limited amount, as it's the leftover merchandise, and when it's gone it will be very gone. Lots of other amazing treasures, posters, t-shirts, prints, and suchlike, at Neverwear: http://neverwear.net/store/index.php?main_page=index&cPath=4 will show you the prints that are currently available. You can give Audiobooks as a gift. Honest, go and visit Neil Gaiman Presents. because you might know someone who wants to listen to Swordspoint, or Land of Laughs, or Pavane... It's the green "Give as a gift" button over on the right. And of course, they're also available in iTunes. And, for person who has everything, I'm not sure that I've mentioned on this blog that Absolute Sandman Volume 5 is now out. It contains Endless Nights, The Dream Hunters, the P. Craig Russell Dream Hunters, and strange small uncollected things that we'd forgotten about when we did the first four Absolutes that people then wrote here to remind me about. On December 28th, I'll be doing An Evening With Neil Gaiman in Sydney, NSW. Special Guests, the FourPlay string quartet. Date and venue and all information will be in the next blog. Keep the date free. And finally, on Dec 31st in Melbourne, Amanda Palmer is having a mammoth musical New Year's Party and Masquerade. I'm hosting it with her, and I will be reading things, and there will be music and guests -- including The Danger Ensemble, Marieke Hardy, The Jane Austen Argument, The Bedroom Philosopher, Mikelangelo and Saint Clare, Lyndon 'Flaming Violin' Chester, Lance Horne "and another special guest so special we can't even announce her yet." It's a limited ticket, one-off event, with regular tickets, VIP tickets (VIPs get STUFF) and all sorts of strangeness. Tickets are at http://revoltproductions.com/melbourneevents/byevent/NYE1 If you're in Melbourne and over 18, I hope I'll see you there. It should be unlike anything else. I was talking to an author last night. Actually, we were sending text messages to each other, something I don't do a lot of, but it was sort of fun, texting. I'm not going to identify her, or the book. She had a novel published recently by a major publisher. I read it. I really loved it. 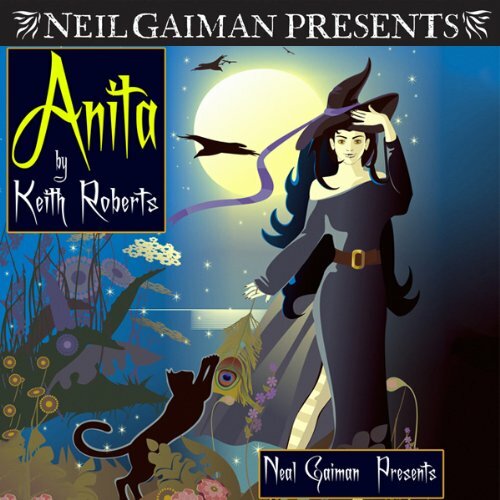 I thought, Why not see if I can do it as a Neil Gaiman Presents Audiobook, through ACX? I asked if there was an audiobook. She said, "No, no audiobook." I asked who had the rights, and whether I could do it in ACX. She was thrilled and said of course, and she'd find out if she had the rights or if her publisher did. We talked about what kind of voice narrator she'd want, and whether a male or a female narrator would suit the book best. And then I got a message from her saying "Oh. Bizarre. I just looked online and see there is an audiobook of (the novel) which no-one ever told me about. It apparently came out in November." I went online and looked. There was indeed an audiobook, and it had a terrible cover. And this morning brought an email from the author saying, sadly "Don't listen to the (novel) audiobook. It might be the worst thing I have ever heard." I felt so sorry for her. Why is there so much hesitation? For me, the tragedy of audiobooks is that the physical limitations and impossibilities of putting out complete novels as audiobooks in the days of LPs and then pretty much in the days of cassettes, meant that the costs and the odds were always against you. Most books aren’t out as audiobooks. If you like a book, it’s probably not been done as an audiobook. Publishers would take audio rights but then never do anything with them. ... That process is that you persuade your publisher to do an audiobook and then you have no control over who gets cast, or who reads it. You have no quality control over pronunciation or goofs or anything like that. And then your publisher brings it out and then your publisher remainders it. That is the problem that ACX was created to solve — and for me it’s also the problem that it’s highlighting. I’m hitting it more and more. All I know is that there could be lots and lots of audiobooks out there that aren’t. For years it didn’t matter that the rights were held by people because nobody could do anything anyway. But we’re not in that world anymore. Can you talk a bit about the importance of the right narrator, and how much that person can add to or subtract from the audiobook experience? I remember once talking to a best selling author about audiobooks. He’d written a book that was narrated by a 20-something black male and the audiobook was read by a 50-something white female. He had no say in this and after listening to it for five minutes he stopped, feeling physically sick. In some cases, when the author is alive and available, I cede that choice to the author. I become the production entity and I’ll cast a deciding vote if the author says it’s between three narrators he or she likes equally. If the author’s alive, I want the author happy. That’s the most important bit. 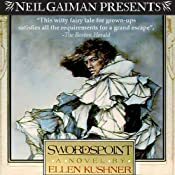 And I felt really extra sorry for my anonymous sad author, because I was SO happy about the release two days ago of Swordspoint -- mostly happy because of how amazingly happy author Ellen Kushner is. (See http://ellen-kushner.livejournal.com/tag/audiobook for proof and background.) Swordspoint's an audiobook narrated by the author, with additional soundscape and acting from such luminaries as Simon "Arthur Dent" Jones, and it's a thing of joy. She's happy, I'm happy, the people listening to it seem amazingly happy, the people at Audible.com are ridiculously happy because people are downloading it and the reviews are already coming in and they are happy reviews. And I don't want to turn this into a big plug for Swordspoint, or a rant against publishers wasting or not using audio rights. I think what I want to say mostly is, if you are an author, Get Involved in Your Audiobooks Early. Get your agent involved and interested. Talk about them at contract stage. Find out if you're selling the rights, and if you are selling them then find out what control you have or whether you are going to be consulted or not about who the narrator is and how the audiobook is done. Also, make sure that your publisher has worked out a way to give you free copies (obvious if it's out on CD, much less so if you're on download-only platform). If you're an agent, notice that we are not living a decade ago, when audiobooks were expensive bells and whistles that meant very little, that normally wouldn't be done for anything outside of major bestsellers, when abridgments were often the order of the day: we're entering a golden age, in which there is no reason that any book shouldn't be available in professionally produced audio. Unless you know that the audio rights are going to be used and used well, keep them for your author. And if they are being sold with the book, then guard your author, and make sure that she or he gets rights of approval. But this isn't an ad for ACX, either. Honestly, you can do it on your own, if you want: Find a narrator or a studio; you can release it through the web; you can give it away as a promotional item, or because you can. Or you can make sure that if your publisher is putting out an audiobook that you have a say in it, and it's the book you want it to be. Because otherwise it might be you writing to friends telling them not to listen to the audiobook of your book. And that would be a terrible thing indeed.